The Fitbit Surge is about to get a major update with functionality that enables it to automatically track your cycling activities - distance, location, average speed, time, heart rate and calories burned are all included - saving you from entering everything manually. After running, biking is the second-most popular outdoor activity for staying fit and healthy according to a report quoted by Fitbit. That means there should be a lot of users eager to give this new feature a whirl. It's also being showcased during a charity bike ride across the United States. It's part of the Fitbit Surge's Multiple Sport Mode, which already covers several key types of activities, such as running, hiking, weights and yoga. Routes recorded in bike mode can be loaded up on the web or through the Fitbit app on iOS or Android. Fitbit is also unveiling another new feature this week: Multi-Tracker Support. As its name suggests, it lets you swap between different Fitbit trackers without losing any of your data between the cracks - you can pair up to six devices with a single Fitbit account. The idea is you might wear a Fitbit Surge at the gym and a Fitbit One at the office, should you be so inclined. With five hours' battery life on the Surge if GPS is constantly enabled, you might need more than one for those long days of cross country cycling. 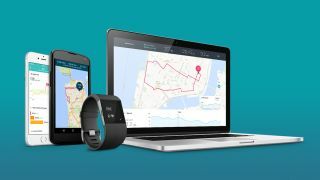 Fitbit Surge bike tracking is coming to the US next month and will roll out globally at some unspecified point in the future.